For the last ten summers, I have escaped the brutal heat in my home territory of Sonora, Mexico and headed north. During these two or three month forays, I lived in my small camper in the forests and meadows of the Pacific Northwestern United States and Alaska. I traveled slowly, did a lot of photography, and camped in public lands away from humanity. In this way, I could engage Nature without interference. It has been a wonderful life !!! However, I experienced some discomfort over these years as I visited many forests. At first I could not define my source of uneasiness. With time I came to realize that I was living in new growth forests that had been clear cut and hand crafted by mankind and not by Nature. The almost boring regularity of trees was caused by foresters and not Nature. The manicured ground that was devoid of ground cover was almost too perfect. In a sense, this man-made perfection seemed almost surreal. These sterile, manicured forests “managed” by mankind were produced to serve only the needs of humanity and not a diverse, interconnected Nature. During the summer of 2015, some wonderful friends suggested that my partner and I visit the old growth forests of the Northern Cascade Mountains and the Hoh Rain Forest both in Washington state. These visits resulted in an incredible experience of truly engaging a highly connected ecosystem. I felt privileged to observe and be part of it all. In the rain forest, I realized that I was witnessing Nature as she served herself without any interference from the human race. Humans were keeping their distance and protecting Nature from the loggers, developers, and human noise. Except for a minimal number of roads, trails, and campgrounds, things like hotels, shops, and gas stations were absent. Thanks to the US Park Service and the US Forest Service, Nature is protected so that she can do her own thing. Nature is left alone to serve Nature. 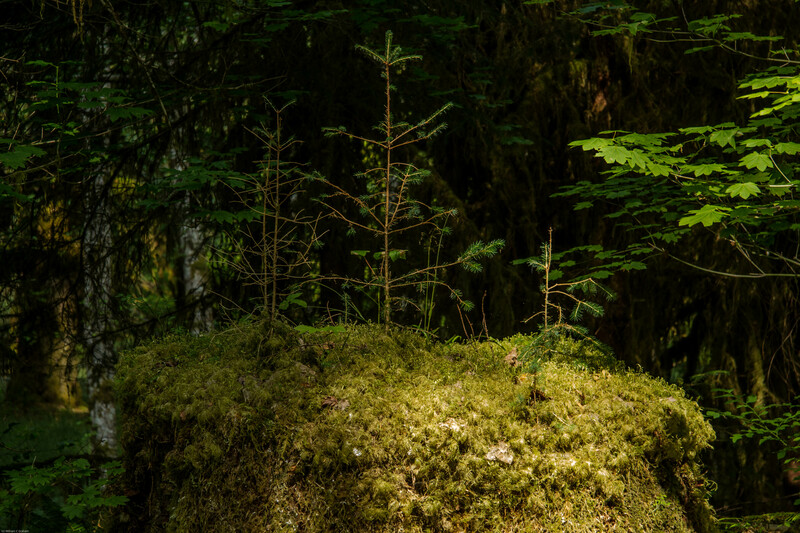 In the Hoh Rain Forest, we witnessed how old growth creates new life. New plants and trees were sprouting up and growing from old dead logs and other organic matter. Moss lives in the tree branches without ever touching the ground. The result is great biodiversity, massive complexity, and richly resilient forests where everything is interconnected. When I realized all of this, I was able to put some meaning to this calm that I felt. It was the strong evidence of a connected Nature that drew me into this forest for an extended stay. It was sitting under a Bigleaf Maple tree that kept me dry during the daily rains and left me with a feeling of being embraced and included. A feeling of total engagement. While my words may serve to communicate these feelings of connectedness to some of you, others may wish a more vivid portrayal. 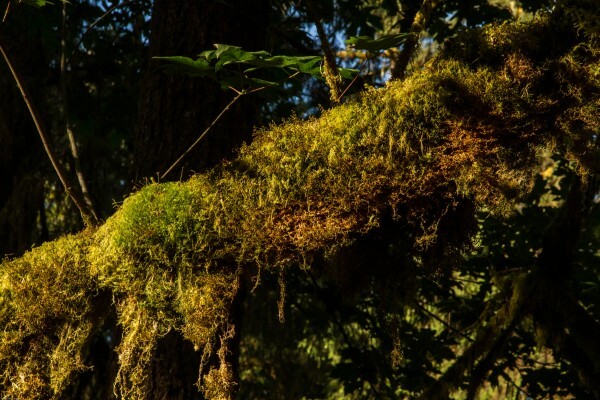 In my view, the rain forest’s iconic nursery logs and hanging moss define some of the connectivity that helps this forest ecosystem function. Let’s pause for a moment and define what we mean by connectivity. All life on Earth needs energy to live. Energy is the currency of life. Interconnected conduits between all elements in Nature is necessary so that energy can be transported to each part of Nature. The source of all energy on Earth is the sun. Everything, either directly or indirectly, depends on life giving solar energy. The sun’s energy is first received by plants (remember photosynthesis in our high school biology class?). We and other creatures need to eat these plants to get our supply of energy. Many creatures like wolves and humans, also get energy by eating other creatures who eat the plants who receive energy from the sun. Everything, including we humans, is part of this interdependent food chain that becomes the conduit for energy flow so that all living plants and creatures may live. Not all energy flows in direct links. Some things in Nature take place because of the remote actions of something else. This phenomenon is called a “trophic cascade”. For example, in the forest, elk and deer eat tree shoots. If there are insufficient predators like wolves and cougars, the elk and deer populations expand to a point where these animals over-eat the tree shoots and affect the ecosystems that depend upon trees. With the presence of predators, the elk and deer populations can remain in check and the tree populations can flourish. In this way, the presence of wolves affects the number and the health of trees in a forest. Trophic cascades are the indirect and complex effects of changes in Nature’s energy flow. The old growth forests that we visited are untouched by chainsaws, purposeful tree spacing, and groundcover manicures. Animal populations are not regulated by mankind. The result is a deep richness in habitat, biodiversity, and resilience. 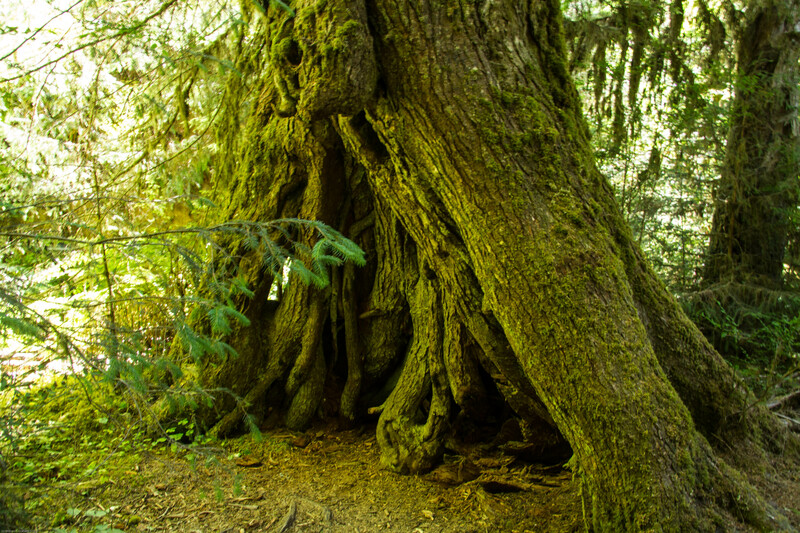 This is all possible because the old growth forest has developed a multitude of direct and indirect interconnections that are lacking in new growth forests. 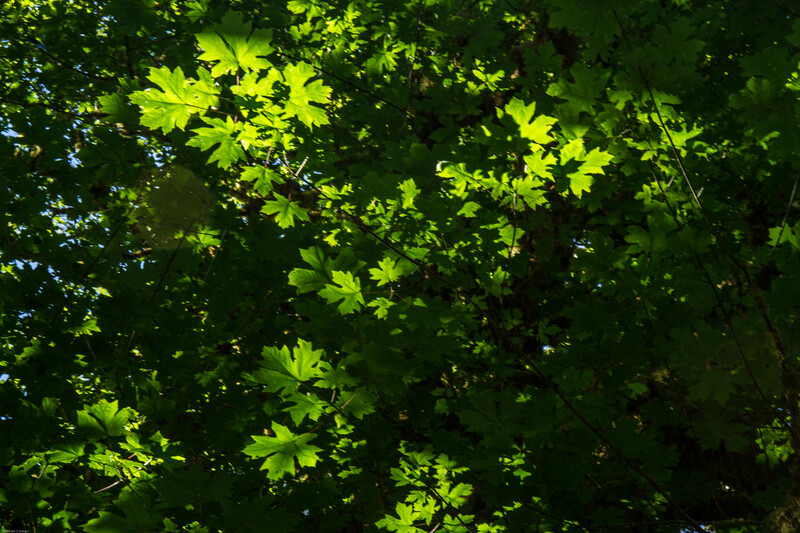 In new growth forests, Nature’s interconnections have not had time to develop because mankind is continually breaking ecological links through logging, manicuring, or animal culling . My immersion into these old growth forests caught me totally off-guard and set me on some wonderfully deep explorations, adventures, and discoveries. The ecologies of these forests totally captivated me. The most profound lesson that these forests revealed to me is that, unlike new growth forests, old growth propagates new life. I’d like to share two examples of this phenomenon, nurse logs and moss. David Attenborough, in his “Private Life of Plants” describes how a dead nurse log can generate new life. “In the coniferous forests of the north-west coast of America, the trees – Sitka spruce, hemlock and Douglas fir – may grow over two hundred feet high and they cut out most of the light. There is enough, however, to sustain ferns and other shade-loving plants, and the soil is so rich that they form a dense ground-cover through which you wade waste high. But beneath them, on the surface of the soil, it is very dark indeed. Seedlings, even if they were able to germinate, would not be able to gather enough light for them to photosynthesise. How then, can the giant trees regenerate themselves? The two images that follow portray dead nurse logs that are providing new life for new trees. The first image is an old stump that is an ecosystems unto itself. Not only is there a substrate of new ground cover on the stump, but numerous tree seedlings have sprouted and are reaching for the sky. The second image portrays mature trees growing in a row called a “colonnade” . These trees have all sprouted from a fallen log that underlies the line of trees. They now straddle the remains of the nurse log. Even if the nurse log has completely decayed, the buttressed roots of the trees in the colonnade give us a clue about how growth began. You can see how the roots of the trees in the colonnade reach around the nurse log and implant themselves into the forest floor. 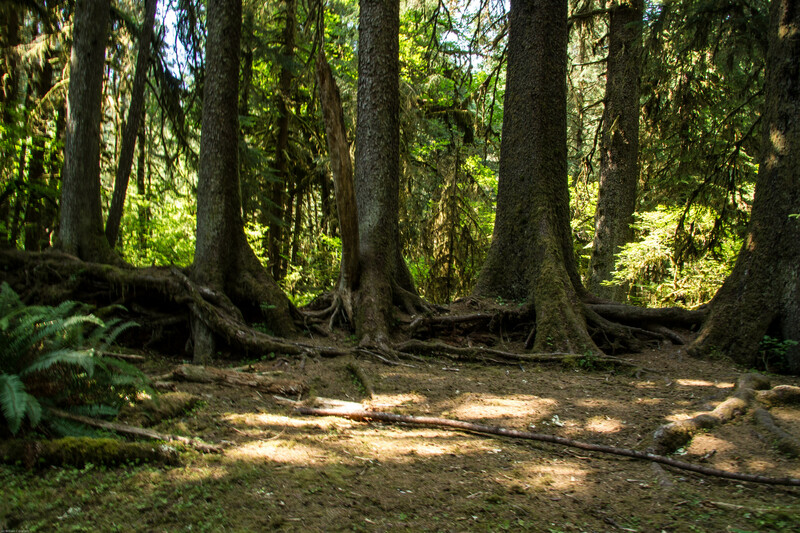 Both images portray the interconnections between the dead logs that are still giving life energy and the new trees who are receiving support from their elders and energy from the sun and the forest floor. As we walked through the old growth forest, these energy connections were everywhere. The idea of old growth creating new life is a secret of these great forests that are untouched by man. It is the basis for the incredible complexity we see in these forests. Those new growth forests that were clear cut, then managed and manicured by man lack this complexity. 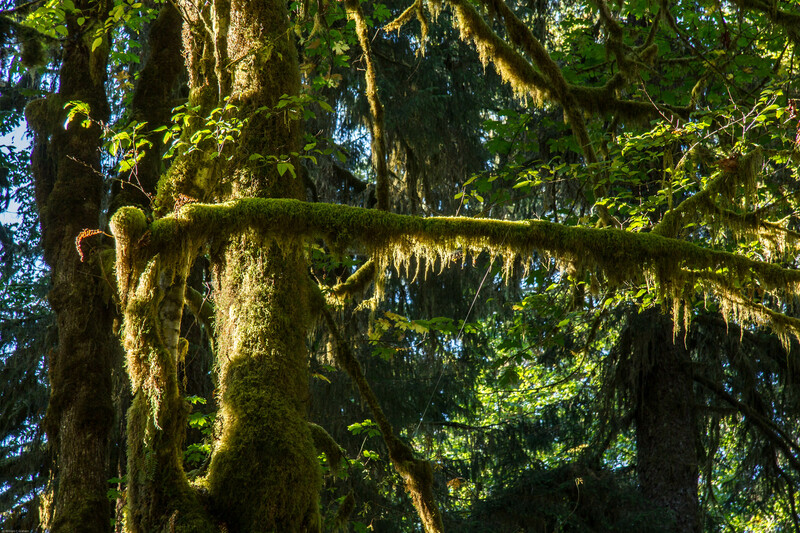 The most obvious first impression that one enjoys when walking through the Hoh Rain Forest is that many trees are blanketed with a rich mosaic of green called “epiphytes”. These epiphytes are 100 different thickly interwoven species of mosses, ferns, fungi, and lichens – a paradise for the ecological mind. The atmosphere of the rain forest is so fertile that some plants thrive on air. These mosses and ferns are sometimes called “air plants”. They attach themselves to trunks and branches without harming their hosts. The Bigleaf Maple tree branches are the most common hosts for these epiphyte gardens. The presence of these epiphytes somehow triggers the tree to create and send feeding roots into the epiphyte mats. Because of this interconnecting mechanism, the tree is able to receive water and nourishment from the epiphytes that so beautifully provide decoration. This image offers a closer look at the interconnected detail of an epiphyte. 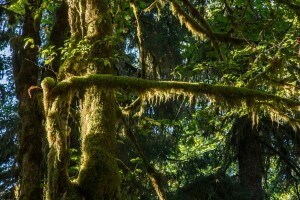 The rain forests of Washington state in the USA provide us with both living evidence of Nature’s basic operating model of interconnectivity and why it works so well when left alone. In stark contrast, we can view manipulated Nature in most forests where logging, grazing, wild animal culling, and agriculture are taking place alongside the current human theories of forest management. These new growth forests lack biodiversity and contains only what mankind deems important. Nature is not allowed to choose what is important. The Hoh Rain Forest is a powerful lesson and model that demonstrates the power of interconnectivity when Nature is permitted to do her own thing. This forest is a lesson for those who choose to listen to her voice. An attentive walk in the woods is an inspiring start to the understanding of connectivity in Nature. The Hoh Rain Forest is a living demonstration that portrays the strength of Nature’s interrelationships unbroken by man. With study, one learns that the richness of the Hoh’s habitat produces its resilient ecosystem because of the high interconnectivity between the multitude of flora and fauna. When we compare the richness of the Hoh Rain Forest with new growth forests, we begin to see the negative effect of mankind’s intrusions on the lungs of our Earth — her forests. Hello Bill. 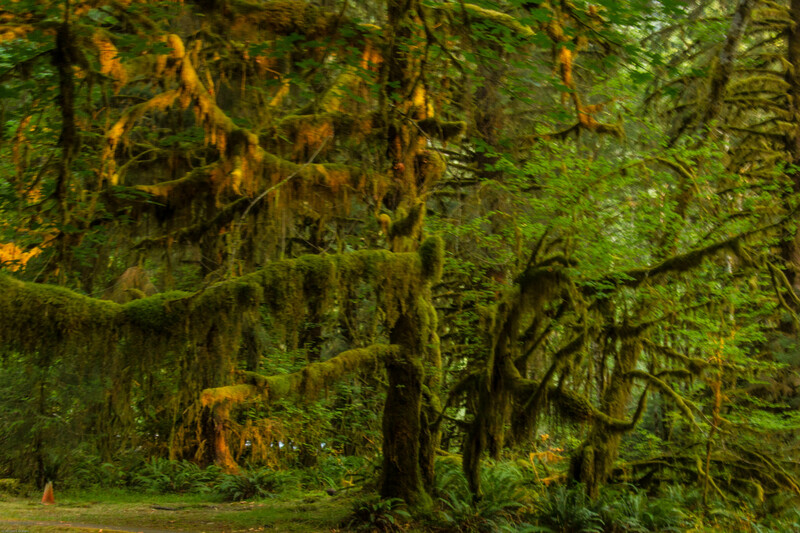 The Hoh rainforest is a very special place. You will love hiking the trails and being amazed at the fallen nursery logs that give new life to the forest.